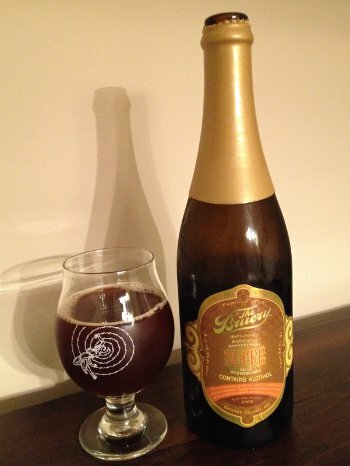 The Bruery's Anniversary beers hold a certain sentimental value for us Kaedrinians, and as such, they've become a much anticipated annual tradition. We're just bananas for this stuff. Like the previous couple batches, this is a massive Old Ale style beer, aged in Bourbon barrels and blended using the Solera method. The names of each anniversary brew correspond to the French translation of the traditional wedding anniversary gifts. Last year's was Bois, and it was fantastic. This year's is Sucré, which means Sugar (or probably more likely, Candy). Those who are familiar with The Bruery's low attenuation, high ABV barrel aged brews will know that Sucré is particularly apt for this brew, as it's is indeed quite sweet and sugary. Not to mention boozy. The previous iterations have all been in the 14.5% to 15% ABV, but this one clocks in at a whopping 16.9% ABV. I'm not sure what they did differently this year, but that's quite a bump from last year, and you can really tell, even if it's still a fabulous brew that I really enjoyed. Beer Nerd Details: 16.9% ABV bottled (750 ml capped and waxed). Drank out of a tulip glass on 6/21/14. Bottled 2/25/14. If you've had any of The Bruery's Bourbon barrel aged stuff, you sorta know what you're in for here. I plan on grabbing another of these bottles for my cellar, just because I have one for every year since Cuir (3rd Anniversary). Speaking of which, I never drank that Cuir, which I should totally get around to at some point. Of course, I only have the normal, 25% BBA version, but we can't all be Bruery Hoarder ballers, can we? Nice. I was shocked when I saw the ABV. It's getting into heavy-duty port territory. One is sitting in the new cellar. Although, the Haybag and I might crack it for the 10th anniversary in August. Yeah, that's a big leap in ABV, but it's still delicious, so I'm sure you'll enjoy it whenever you crack it open... and saving it for your anniversary sounds rather appropriate too! This page contains a single entry by Mark published on June 24, 2014 11:52 PM. Double Feature: Tired Hands Collaborations was the previous entry in this blog. Boulevard Saison-Brett is the next entry in this blog.